The Vigilance Awareness Week is being celebrated from 26th October to 31st October, 2015. The theme for the Vigilance Awareness this year is “Preventive Vigilance as a tool of Good Governance”. The Commission has been laying stress on Preventive Vigilance and driving home the point that vigilance should not be seen in isolation but as a tool to achieve good governance and better operational results. The Vigilance Awareness Week is being celebrated every year and coincides with the birthday of Sardar Vallabhbhai Patel, known to be a man of high integrity. The Vigilance Awareness Week was observed in HPL from 26th October 2015 to 31st October, 2015 and a pledge was administered to all the officers and staff of HPL. 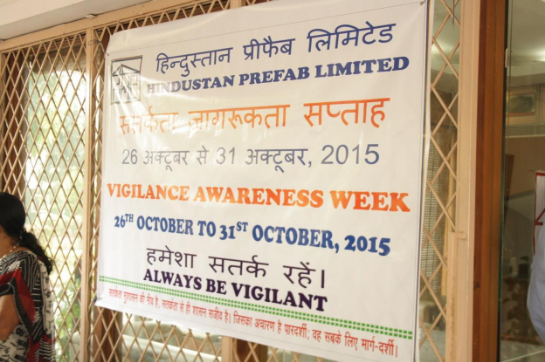 Banners/posters relating to vigilance awareness were displayed in the HPL’s Corporate office.